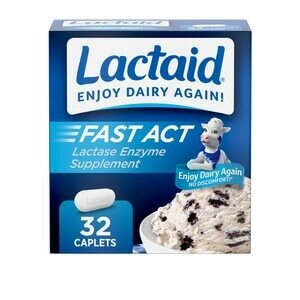 Lactaid Fast Act Lactose Intolerance Caplets, Travel Packs of 1 CT.
Lactaid Fast Act Caplets work quickly to make dairy foods easy to digest for those with lactose intolerance or dairy sensitivity, so you can enjoy everything on your plate. This digestive supplement helps prevent the gas, bloating, and diarrhea that many people experience after eating foods containing dairy. The natural lactase enzymes in this dietary supplement contain 9000 FCC lactase units to help prevent symptoms associated with lactose intolerance by breaking down milk sugar (lactose), so dairy foods are easier to digest. These easy-to-swallow caplets start working with your first bite or sip of dairy food. Certified kosher and suitable for ages 4 and up, Lactaid Fast Act Caplets are available in convenient travel packs making them ideal for on-the-go dairy relief. Consult your doctor if your symptoms continue after using this product or if your symptoms are unusual and seem unrelated to eating dairy. Keep out of reach of children. This is a dietary supplement, NOT A DRUG, and may be used by adults and children 4 years and over. DO NOT USE if carton or single-serve packet is open Store at or below 77°F. Keep away from heat and humidity.